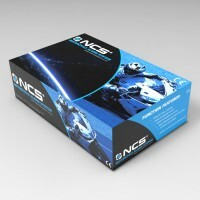 NCS is now an authorised installer. MOBILE FITTING INCLUDED IN THE PRICE – Contact us to arrange the place / time BEFORE you order. Lancaster £339, Kendal £359, Manchester / Bradford £389, Liverpool £399. Note- this ad is set at the Lancaster Rate. Datatool S4 Red CAT1 Insurance approved Alarm and immobiliser fitted to your bike and certified for insurance purposes by ourselves- Official Authorised Datatool installers. For more info contact us here or see our contact info at the bottom of the Ebay ad. Below are the alarm details specifications as listed on the Datatool Site – which we have permission to use. The flagship alarm in the Datatool range, the renowned Datatool S4 Red. This Thatcham Category 1 approved alarm immobiliser system offers the ultimate in protection with dual circuit immobilisation, independently adjustable shock and movement sensors and customisable automatic arming. The S4 casing is one of the smallest Thatcham approved products available, designed with the limited space on modern ABS equipped bikes in mind and features a metal nose cone to protect the siren in the event of an attack. Customisable Automatic Arming: Choose whether the system arms just the immobiliser and anti-hotwire detection or arms the full system including the tilt and shock sensors. 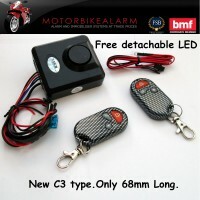 Low Battery Warning System: Audible alert system gives early warning of discharged motorcycle battery. Independent Shock and Movement Sensors: Not only does the S4 detect a change in angle but it also detects impact to give advance warning of the bike or scooter being tampered with. 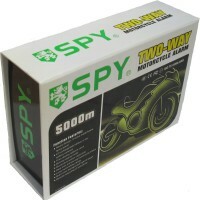 This is especially important for quads and trikes which do not tilt like a two wheeler when moved. Panic/Locate Facility: Trigger the alarm from the remote control to locate your bike or if threatened to attract attention. Storage mode: The S4 Red can be completely deactivated for long term storage with the bike/scooter remaining immobilised until the alarm is reactivated. PIN Override: With a user selectable PIN code the unit can be deactivated if a remote control is damaged or lost. Alarm Diagnostics: If the alarm has triggered whilst you were away, the S4 will bleep a code to tell you which input caused the trigger. Customisable Siren Tones: With a choice of 8 different siren tones, you can choose one which you clearly recognise as your alarm. Provided with every Datatool S4 is a set of Datatool Key Recovery Tags, intended to be attached to your keys and to the remote control. Using a mobile friendly website, these key tags provide a method for lost keys or remotes to be reunited with the owner in the shortest possible time. Also supplied is a ‘Protected by Datatool’ decal to highlight to potential thieves that professional standard security is installed.